Not the White Cliffs of Dover, but The Bluebird shiny newly refurbished restaurant on the King’s Road, Chelsea. 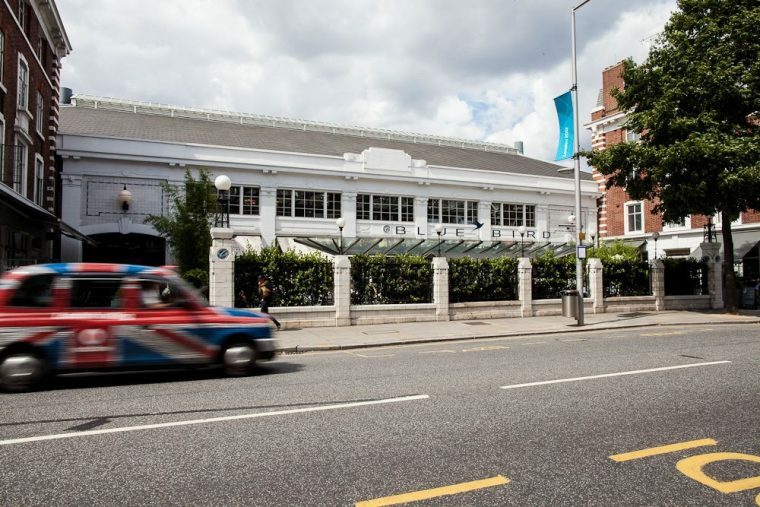 The Bluebird may have started life as a humble garage at the ‘wrong end’ of the King’s Road, but it’s now an elegant, modern, fashionable place to shop, eat, and drink. I doubt any part of the King’s Road could be considered ‘wrong’ these days. I walked from Sloane Square tube station, and thank goodness I knew I needed to be on time for the cocktail making class, or else my credit card would have taken quite a beating. There are still enough boutiques and furniture shops to be found on the King’s Road that aren’t high street chains to keep even the most jaded of shoppers happy. Whilst The Bluebird is part of the D&D chain of restaurants, it has its own identity, and individuality. I have eaten here several times in the past, and I wondered if the millions spent on the make-over would be well-spent. It’s certainly retained it’s industrial heritage, but added jewel colours and quirky art to make it seem less brutal and more female friendly. Frankly, I’d sit at that bar any evening! 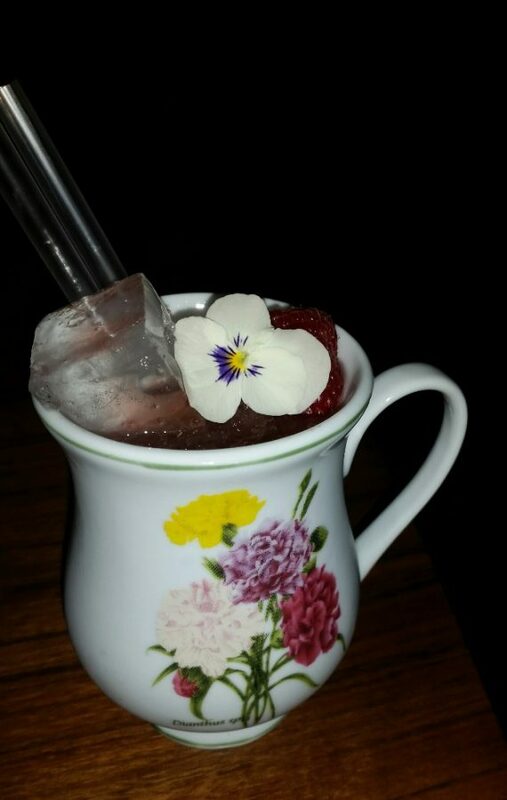 We were invited to have a go at making one of Bluebird’s signature cocktails, the Chelsea Garden, which was created by the head bartender in honour of the Chelsea Flower Show. I think my effort was pretty good, even if I do say so myself. 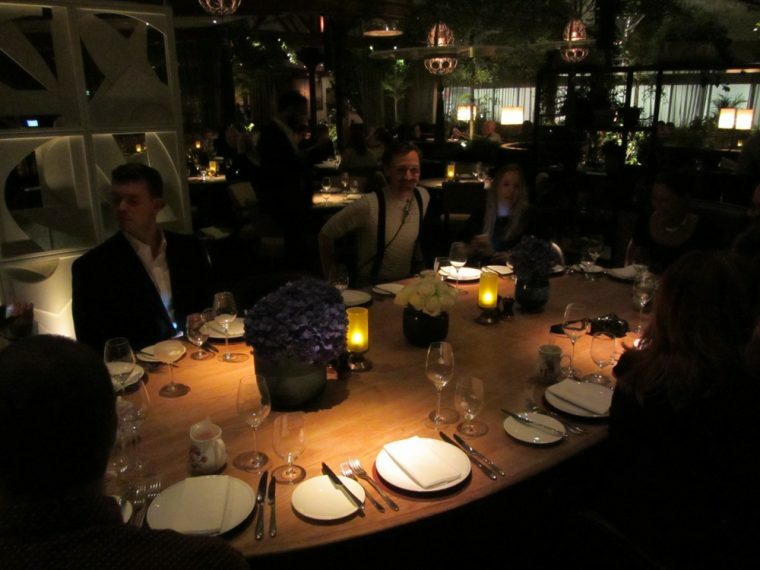 We then moved through into the dining room, where a large oval table was set for the group of journalists and bloggers. Although it was within the main dining space, the clever use of open partitioning made it seem as if we were in our own private dining room. We had a little joke that if we were dedicated enough and drank all the red wine stored behind us, we’d have a clear view of the kitchen at work. 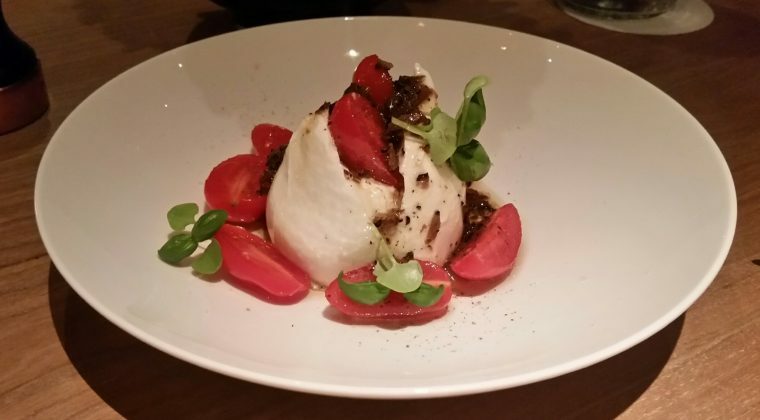 The menu is divided into small plates, large plates, and some sharing plates. 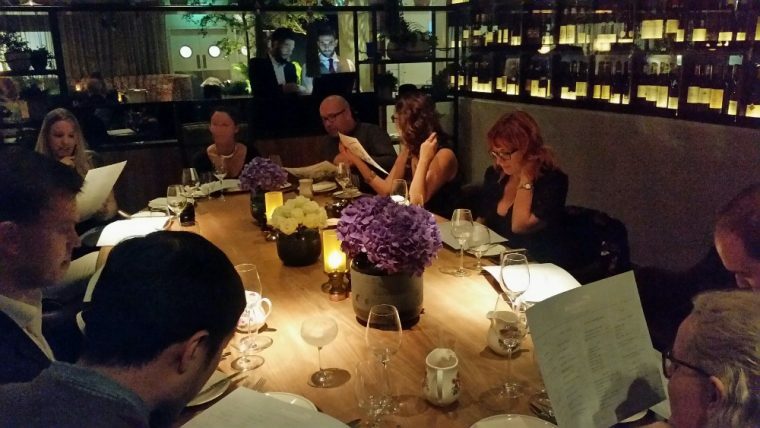 The advantage of dining in a groups such as this, is that the group can order a selection of dishes for sharing. 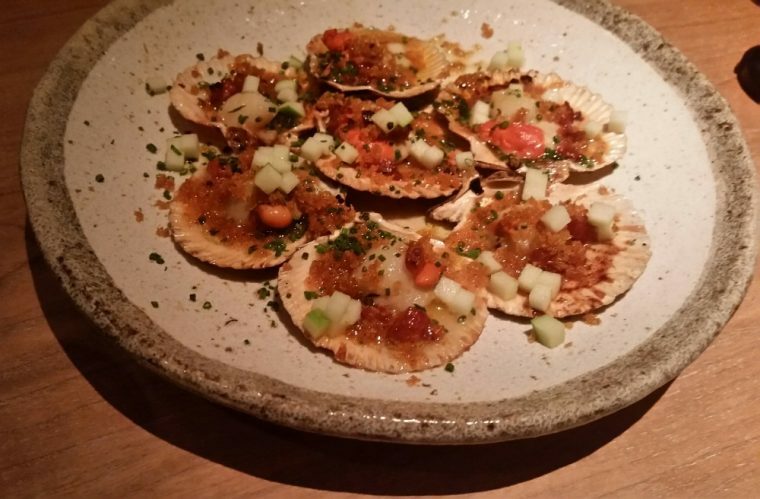 Although we didn’t have everything on the menu, we certainly got to try quite a few of the small plates. Among the dishes we sampled were; a wonderful creamy burrata, queen scallops with chorizo and apple, fried baby squid with chilli and lime. 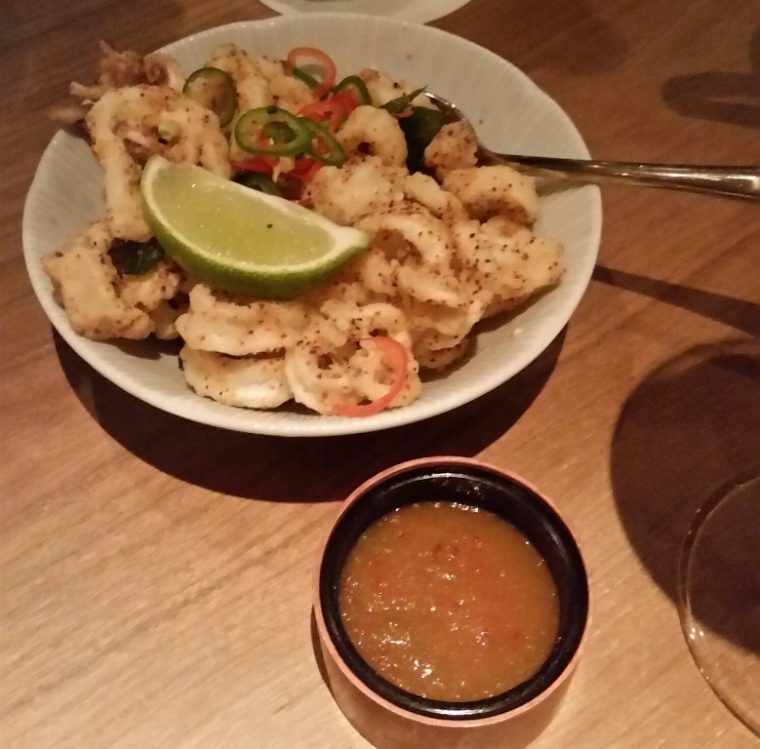 Small plate prices range from £6.50 for the squid to £19 for half a lobster. 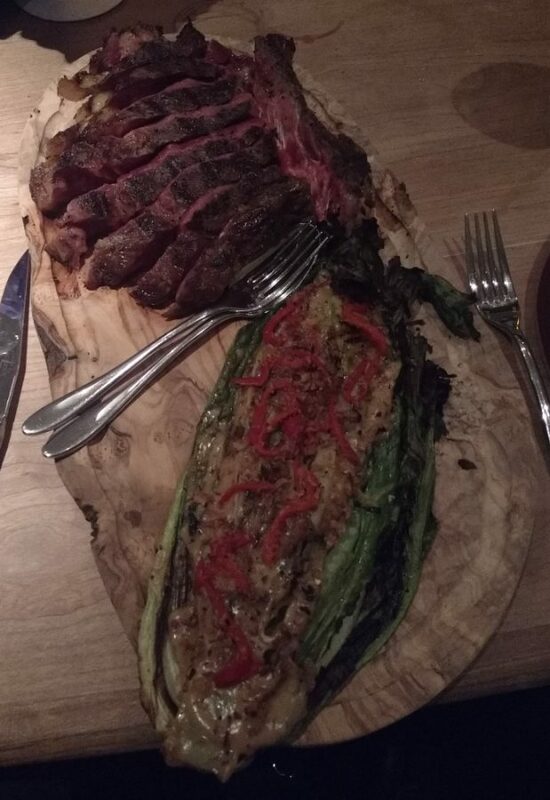 We opted to share a rib-eye with charred romaine and picquillos for our main course, we asked for rare, and it was served perfectly cooked. Large plates range in price from £14.50 to £65 for the sharing plate. 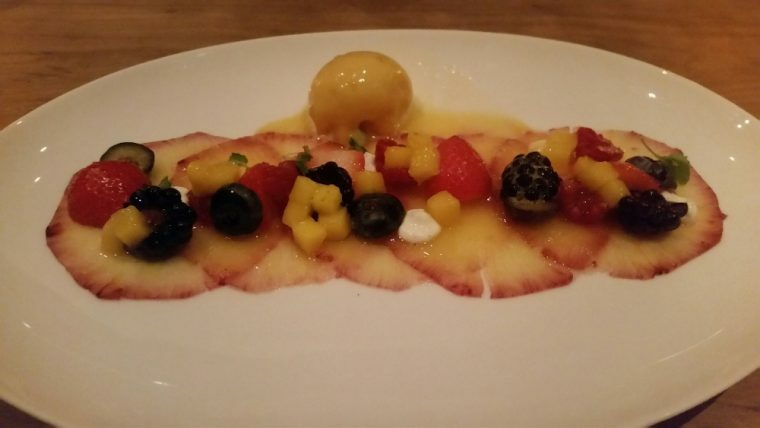 To be honest, I was beyond full, so the rather delicate pineapple carpaccio was just perfect to cleanse the palate. Given it was a Monday night, the restaurant was busy, full of happy diners, ranging from families, friends, dates. 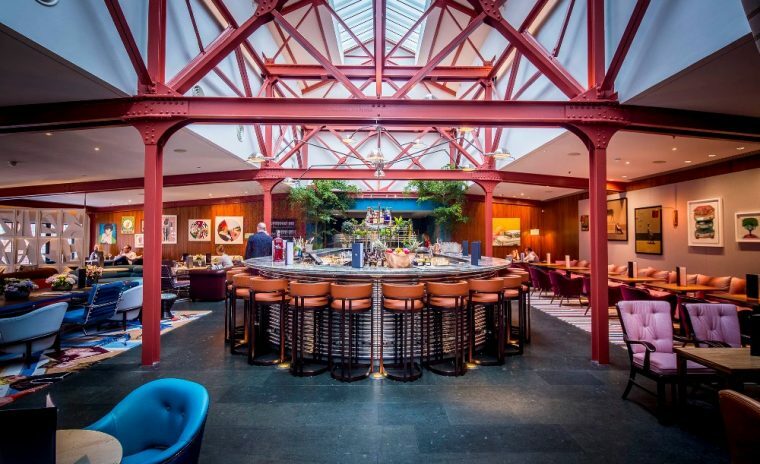 It’s pretty clear that the refurbishment has enabled The Bluebird to remain a favourite of the Chelsea set, and will draw in new customers through the cafe and downstairs shops. I know that the next time I hit the King’s Road for some serious shopping, that this is the place I will come to in order to recover!